The Workers' Compensation Act is a workers compensation law poster by the Rhode Island Department Of Labor and Training. This is a mandatory posting for all employers in Rhode Island, and businesses who fail to comply may be subject to fines or sanctions. This poster must be posted in a conspicuous place by all employers so that all employees can see it. This poster describes how to get workers' compensation if injured while working and how to find out more information on workers' compensation. It appears you don't have a PDF plugin for this browser. 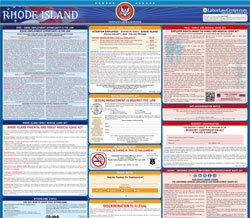 Please see the link below to download rhode-island-wcenglish.pdf. report shall be made  within ten (10) days of the injury. An injured employee shall have the freedom  to choose medical treatment initially. or insurer to provide priority care  shall not be considered the employee’s initial choice. suspect fraud, contact the Fraud Prevention  Unit at (401) 462-8100 and press option #7.
and maintained in conspicuous places where workers are employed. Fines may be imposed for noncompliance.